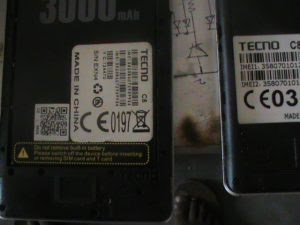 How to know Tecno C8 camon fake and original. In the market especially in Africa and Asian countries where standard qaulity control is lacking you may end up buying fake phone in original price. You have to get our tips carefully in order not to fall a victim of counterfeit product. There are many of these products out there that just look as original but not. Here pictures are used to tell the difference. From the picture above it shows that this is not a removable battery. that is the original one. But in the fake you can remover the battery. The battery can be removed without disassembling the phone. Another point to note here is that the two phones sim slot are not the same. The position of the original is side-by-side where as in the fake the position of the sim slot is in parallel. The touch light of the fake one is more brighter than the original one while the original look dim. 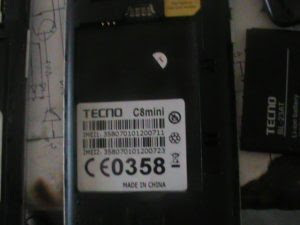 The original Tecno C8 camon is inscribed just Tecno C8 but the counterfeit(fake one) is writen Tecno C8mini. 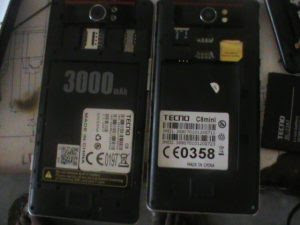 Powering the two phones you notice that the original one boot by showing Tecno C8 with delay on Camon but the fake one just boot with tecno noise. Although the Tecno C8 canon original and Tecno C8 fate are both MTK android phones but the scatter file are not the same. And flashing Tecno C8 fake care should be taken because it behaves as SPD smart ohone and may die on the process of flashing. Comparing the two phones, the first is the original one, be careful why you make the choice. According to users both are almost the same price. Again both phones look alike in front and back. Size and weight are same. check well before you buy. As I question if the card would even be adequate, Fake id many have reacted that they have just chatted with the airplane terminal and were informed that any type of photograph identification would be satisfactory.